Steven Outram has been described as a ''mood painter par excellence''�. Here we see how Outram''s contemporary paintings are representations of states of mind using naturalistic imagery. There is a very real sense of peace in this painting. This impression is reinforced by the limited palette of colours used and Outram''s use of contrasting light and dark spaces. Most of the canvas shows a vast expanse of sky streaked with cloud after the sun has set and there is only the ''gloaming'' light left to illuminate a lone figure walking the hill. 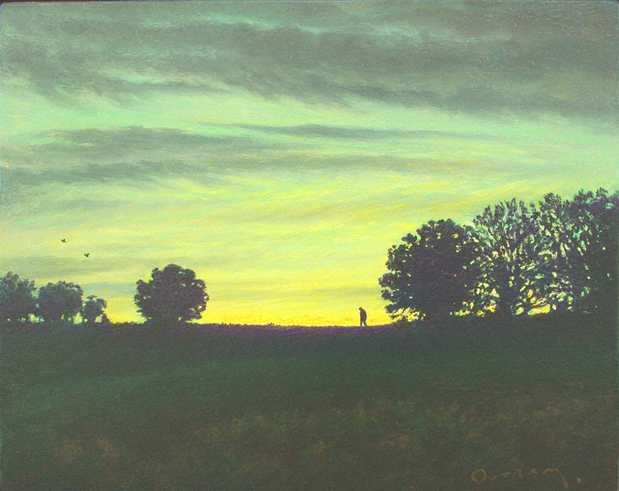 Outram''s paints the human figure on the horizon, apparently dwarfed by the enormity of the sky. We get a sense of Steven Outram''s respect for the beauty and power of nature in this contemporary oil painting.